It does (Edited). One can assume capital costs of between US $300-$500 Million. Again, a lot of assumptions must be made with Deep Yellow, as it is a young exploration-stage company. A lot of rivers must be crossed before they graduate to development-stage. So the numbers are pure speculation. In the meantime, monitor progress at Tumas. Keep an eye on exploration costs per lb. Be mindful of the frequency with which they are tapping the market for capital. If they make an acquisition, ask yourself if it is genuinely accretive. Did the acquisition do irreparable harm to the balance sheet? Or was it a well-timed, synergistic acquisition — the right acquisition at the right price (the window to buy cheap lbs. in the ground is closing). When you run your numbers, be hard on the company. 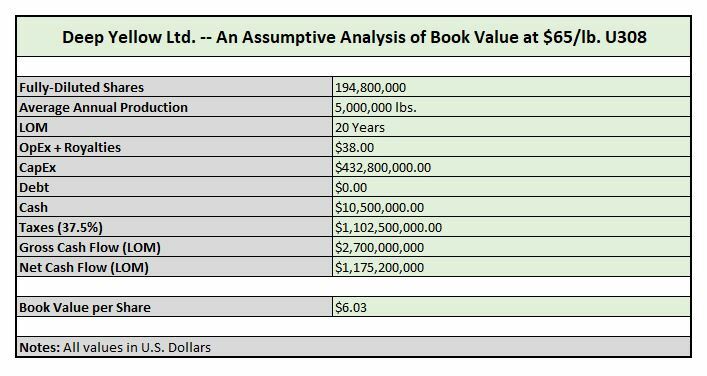 And finally, know that Book Value and share price are very different things. Deep Yellow could trade at a fraction of Book or a multiple of Book, depending upon market sentiment. No one knows. I noticed on your twitter that Deep Yellow was the smallest portion of your U portfolio, much smaller than the other stocks, even the less good and riskier companies. Is it because you are waiting for them to tick a few more boxes or it just isn’t attractive to you? You gave it one of the highest upsides….. 1.) Deep Yellow has a small Measured & Indicated Resource base (~46 Mlbs) relative to its present capital structure. 2.) Deep Yellow needs to get its Inferred resources proved up before I re-rate Deep Yellow. Until then, my allocation to the company won’t change. 3.) I believe a shrewd acquisition would cement the value proposition for Deep Yellow, but as of last month, their strategy has shifted from a pursuit of accretive acquisitions to existing resource enhancements. So, although I believe Deep Yellow will be rewarded with a speculator’s premium, I don’t consider it a premier African uranium play. In other words, it’s not Paladin 2.0 in my opinion.